Want to take 5 to 10 years off your appearance without any pain or downtime? Titan™ is the answer. 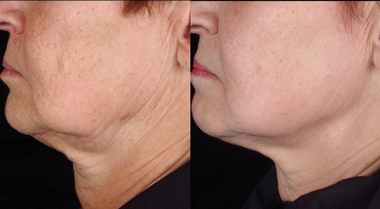 Now there is a way to achieve non-surgical skin tightening with minimal pain, no downtime, and a fraction of the cost of plastic surgery. Titan™ is the cornerstone of the new 3D Skin Rejuvenation Program. It's an ideal solution to enhance your youthful and healthy appearance without surgery, recovery time, or injections. The new Cutera® Titan™ gives you an all-natural option to tone, lift, and tighten your skin. Titan™ utilizes a safe infrared light to heat the dermis well below the skin’s surface. It stimulates long term collagen remodeling and rebuilding that leaves you with younger looking and tighter skin. Clinical results confirm improvement in 75% - 90% of the patients treated. The Titan™ procedure treats sagging and loose skin throughout the body. The most common areas treated are the face, jaw line, under the chin, the abdomen, thighs, and upper arm “batwings”. With minimal discomfort, no downtime, no anesthesia and plenty of results, it is becoming a very popular treatment. After an initial evaluation of the health of the skin and the underlying collagen, a thin layer of aloe gel is gently spread on the area to be treated to cool the skin and facilitate the movement of the treatment head. The area is treated in dime-sized segments. When the treatment head is applied, the patient feels an initial cooling with the Titan™ hand piece, then a short heating cycle followed by a cooling phase. Each cycle lasts approximately six seconds and multiple passes are typically used. The brow, lower face, and neck can usually be treated in an hour, and most patients can resume activities right away. No downtime or pain medication is required. This is a nonablative, nonsurgical lifting procedure that causes the collagen in the dermis to contract and tighten. Titan™ employs infrared light to lift and tighten the skin so that gravity changes are softened, fine wrinkles are less obvious and pores are shrunk. There is no dimpling of the skin because of the even energy source. Because the heat is applied deep within the skin, minimal swelling and redness occurs. At the conclusion of the treatment, a medical-grade sunscreen is applied. Again, there is no downtime and no specific after care is required. Most patients are essentially pain free during this procedure. We use the latest technology to minimize any discomfort. We also continue to apply our specially formulated highly effective topical cooling gel during the treatment. This is sufficient for most patients. As an additional measure, we use the Zimmer cold air device, which gently blows cold air against the skin, to facilitate comfort. During the six-second cooling and heating cycle, patients will only feel heat (a mild pinching sensation) for 2 seconds. As every person has a different threshold for pain, for those especially sensitive patients, other protocols have been developed to ensure that the treatment is extremely comfortable and tolerable allowing you to fully enjoy the results without pain. A single treatment has produced very good results for many patients. Results begin to be apparent by the conclusion of the treatment and continue to build over the next 12 weeks or longer. This is probably the most difficult part of this procedure as the full effects of the treatment are not seen immediately. Dr. Surani will advise you as to the number and frequency of treatments recommended for optimal results. Depending upon the individual patient, best results are sometimes obtained when the procedure is repeated in four weeks. 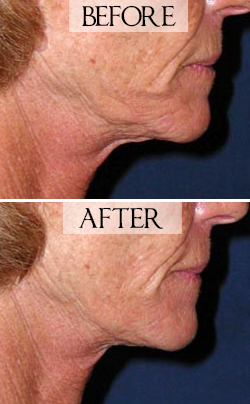 Skin tightening has been shown to last up to two years. The Surani Clinic is currently the ONLY clinic to offer this exciting new cosmetic procedure in the Leaside area in Toronto. This procedure has been featured on Oprah and The View. It has also been highlighted in articles from Vogue, Bazaar, In Style and many other magazines.